Hey! Glad you could make it. In this post I am focussing on dyeing, because I just got a huge box of undyed roving delivered! Dyeing is definitely a current and ongoing activity and one of my favourite parts of the yarn making process. I love colour! I love how there are infinite shades that create even more beautiful tones and colours when they mix and blend. It really is endless possibilities when you’re dyeing, and wool and fibers provide such a wonderful medium for experimenting, allowing not just for colour play but to take it further, what happens to my colours when they are spun? How do different spinning techniques change the colour mixes in this roving? And then what happens when that yarn is knitted! See its so cool! So today I am going to show you one of the simplest ways I know of to get some pretty colours mixing it up in your roving. In the roving you see pictured here, and in the video, you can see some gorgeous white streaks through the fibers, i LOVE this! I chose this blend specifically to get that effect, its merino with bamboo through it, and the bamboo doesnt take the dye but stays wonderfully white and streaky – its such an easy way to get this really pretty effect! If you dont want that though, just use a roving thats unblended or blended with fibers that will take the acid dye (protein fibers). This is a really simple technique, its fairly kitchen friendly (unless youre a Mess Goddess like me and it just generates itself around you), and you can get some lovely vibrant colours and pretty blends without the extra time it takes to hand paint. If you want more pastel and softer shades just make your dye stock solution weaker by adding some more water into it. One of the advantages of setting the colour with this technique, is that it basically steams in the bag, so unlike in the microwave, the heat is dispersed evenly through your fibers, its less damaging and gives a nice heat through all your roving. You can also use a similar technique of wrapping your roving in plastic and nuking it in the microwave, but I think this gives a more consistant result, and its quick and easy, you just need to wait a bit longer for the heat to build up. Okay, so you have soaked your fibers for a couple of hours in water with vinegar added, I put in about half a cup of vinegar and enough water to cover the roving. You can add more vinegar, its the acid that makes the dye take on the fibers. Since we are not adding the roving directly to a dye bath which can have extra vinegar added if its not exhausting well, I usually figure its a good idea to add a bit extra to the soaking solution.. The next thing I do is actually give the roving a bit of a spin in the centrifuge – if you dont have one, let it drain really well and give it a gentle squeeze, the idea is to not have a lot of liquid left in it to dilute your dyes, you dont want it dry, but certainly not dripping. 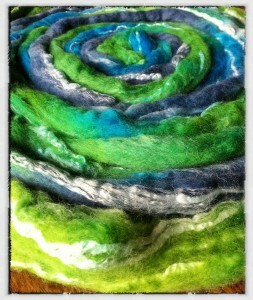 The liquid you want in your roving is going to be pretty colours! Then put the roving in the bag, let it spread to fill the bag laying it flat on the counter, so you have about one layer, doesnt matter if its all jumbled up, thats a good thing After that you start carefully pouring in your dyes, one colour at a time, and very gently pressing down through the bag to help the dye spread through the fibers. This is the point at which you discover if your bag has a hole in it or not…it can be a good idea (which is why I didnt do it) to put a layer of plastic down over your counter top first.. Okay so add each colour into a different section and let it blend into the colours alongside as you press on it. Just pour it onto the fibers, you want to get plenty of dye in there so that you dont get white patches, but not so much that the fibers are swimming in it. Then you seal up your bag, I usually take out as much of the air as I can but its not critical, it just stops it floating too much, and then immerse it into the water in you pot and start it gently heating. Basically its going to steam in the bag. Bring it up to temperature, it mustnt boil, but it needs to be at least 85 degrees centigrade (185 fahrenheit) for a good half an hour. Turn the bag over during that time to let the dye disperse more evenly. When you gently pick the bag up check that the liquid that will pool in the corner is clear, showing that the dye has exhausted. If not let it steam a bit longer and recheck. You can also leave it overnight in the bag to be really sure. If you cant get it to totally exhaust you will need to very gently rinse it till its stopped bleeding dye, some colours seem to want to exhaust much easier than others! I have most trouble with some reds, and turquoise. I always give my roving one rinse anyway, and again of course after I spin it to set the twist, when I also use a nice Eucalan wash so it smells and feels fresh and soft. Just be sure to be very very gentle with your rinsing so as not to felt it. I find that this in the bag method actually helps prevent felting by preventing movement, as the fibers are safely sealed up in the bag, but I take it out of the bag to rinse. 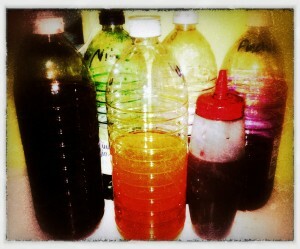 Thank you…….did 4 batches tonight. Used our English Leicester/ Suri Alpaca blend which is a sliver grey base and even the batch that I didn’t completely cover in dye came out looking great. Can’t wait I get home from work tomorrow to do some more. Wonderful technique. I’m new to dyeing and the problem I’m having is that my fiber seems a bit felted after dyeing..I am trying to handle it carefully but I’m wondering if your technique leaves the fiber soft after dyeing? I’ve never dyed wool before but am going to attempt for a felting project. I’m going to try your method described above (thanks for sharing!) I have a light gray un-dyed roving. Wondering what colors and what type of dye you would recommend? HI Jill! If youre dyeing a naturally coloured wool you can get some beautiful results, especially with jewel tones over the greys. You will needs a ‘protein dye’, one that is created for fibers that are animal based (rather than plant based), I won’t suggest any specific brand because they are all pretty good 🙂 Just check that you are buying one suitable for use of wool fibers. You will also need some acid to help it stick to the fiber, you can most easily use a few tablespoons of vinegar added to your mix for this. Good luck and happy dyeing! I am trying this, thank you your yarns are beautiful and you make it look easy wish me luck ! I really like this technique. Thank you!